Makeup palettes are the perfect addition to your stash. They are easy to travel with and can create a makeup look with ease, in fact neutral eyeshadow palettes are an obsession of mine. 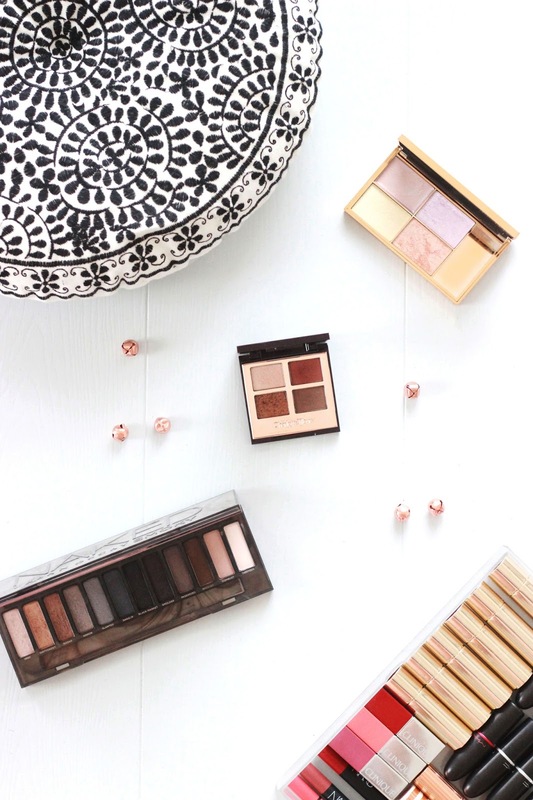 Although I already own 15 palettes I always tell myself I need another one, so today I thought I would tell you what makeup palettes I have been loving lately. Sleek Solstice Highlighting Palette | Although I am a hoarder of highlighters, I actually don't own many highlighting palettes. When I first set eyes on this Sleek offering I knew that I had to have it. This versatile palette can be used to brighten up the inner colour of your eyes, to define the cheekbones or swept across the décolletage to add a sheen to the skin. Ecliptic, Hemisphere, Subsolar and Equinox are the four shades that make up this quad. Although this palettes contains an array of formulas, the cream offering, Ecliptic definitely has me hot under the collar as it can be used as to add a subtle lit-from-within glow to the skin or it can be built up to look more intense. Charlotte Tilbury Dolce Vita Palette | This palette was high up on my wishlist for many months, but I told myself that I didn't need another neutral palette. This luxe quad has quickly become one of my most used and loved palettes due to the quality, long lasting shades that can create a range of eye looks suitable for both day and night time wear. The champagne, burgundy and brown hues always look flawless and are perfect for the Winter months. Urban Decay Naked Smoky Palette* | When it comes to eyeshadow palettes, Urban Decay can do no wrong. After much deliberation and rifling around in my collection, I decided the the Naked Smoky palette is the one palette you need to own. With an array of rich, neutral shades ranging from metallic greys to soft browns, all shades are easy to wear and effortless to blend. If you're looking for a palette that can create several diverse eye makeup looks then this will be your best option. What is your favourite palette? Laura Mercier Crème Brûlée Duet.